Who does rick really work for? For-Profit Prisons. 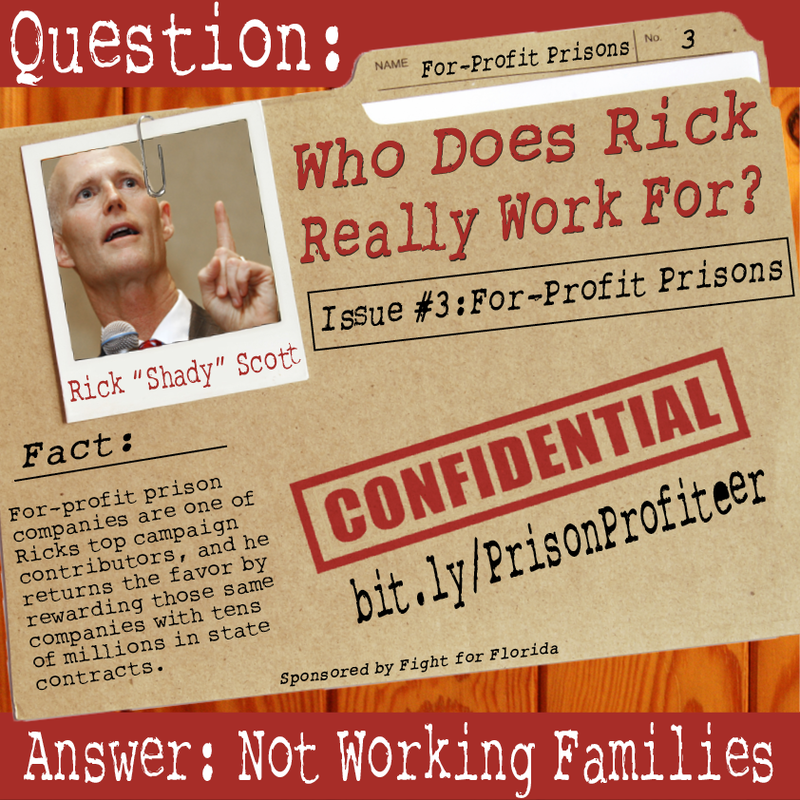 Rick $cott: Pri$on Profiteer: In Florida, for-profit prison interests have spent close to $1.5 million towards buying Rick Scott’s support in the 2014 elections. Earlier this year, Scott attended a fundraiser at the home of the CEO of the GEO Group, the second-largest private prison company in the world. Rick Scott’s “Let’s Get to Work Committee” has received at least $365,000 from GEO and related companies alone. The GEO Group gave Rick Scott’s Let’s Get to Work PAC $315,000 dollars in the 2014 election cycle. The GEO Group gave the Republican Party of Florida $1,016,000 dollars from 2009-2014. Governor Rick Scott has done his part by supporting legislation that would have privatized nearly a third of Florida’s prisons, pushed (unsuccessfully) by The GEO Group and other for-profit correctional facility companies. From 2010-2012 when this legislation was introduced, the for-profit lobby unleashed over a hundred lobbyists to push the measure, spending nearly $200,000 a quarter. Despite Scott’s strong support for prison privatization, and thanks in large part to the efforts of civil liberties and labor organizations fighting the measure across the state, the legislation did not pass. Although this legislation failed, that hasn’t stopped Rick from handing out contracts to one of his largest campaign contributors. Under Scott in 2013, The GEO Group was awarded contracts to manage 76 percent of Florida’s private prisons worth $57 million annually. What’s the problem? If the sheer immorality of having a private industry make billions off of keeping people in prison isn’t bad enough, for-profit kingpins have gone to record lows to keep costs down and profits up. Across the country and in Florida, for-profit prisons have a track record for mistreating their prisoners, including improper food and medical care and putting inmates in what an ACLU lawsuit calls “barbaric” conditions. It is not only the prisoners that suffer under for-profit prisons. Corrections employees who work for these companies work for substandard wages, under inadequate security practices and with little training on how to effectively manage inmate populations. Since 1970, our prison population has risen 700%. One in 99 adults are living behind bars in the U.S. This marks the highest rate of imprisonment in American history. Our incarcerated population has exploded for many different reasons, but in large part it is due to the failed “war on drugs.” To put a number to that claim, 50% of the federal prison population is behind bars due to drug charges. These shocking statistics have led to a strong effort by civil liberties organizations to push for federal legislation in an effort to scale down America’s addiction to incarceration for minor offenses. So what’s the hold up? More Prisoners, More $$$: With the claimed incentive of saving tax dollars and alleviating overcrowding, many states have turned to the multi-billion dollar for-profit prison industry as a solution to the growing epidemic. From 1999-2010, the number of individuals held in private prisons grew by 80 percent, compared to 18 percent in not for-profit federal institutions. For-Profit Lobby. Across the country private prisons have spent tens of millions of dollars in lobbying efforts to support legislation that keeps their cells full, including mandatory minimum sentencing and zero tolerance policies. A special low comes with their efforts in fighting against immigration reform and for the draconian immigration legislation Arizona passed in 2010 and the similar Florida bill that failed 2011. Why? Maybe it’s due to the fact that half of all immigrants detained by ICE and federal officials are held in facilities run by for-profit prisons, reaping them profits of up to $5.1 billion. It’s all about the $$$: In the pockets of Rick’s big business buddies that is. The fact remains that putting profits over working people is not good public policy, but when prison profiteer Rick is given that choice, he’ll always take the $$$ and run. Posted in WDRRWF, Who Does Rick Really Work For?